"In some odd corner of Paradise..."
In a rustic and homely atmosphere you will be welcome in rural houses from the Eighteenth century completely refurbished. In the peaceful quiet of the nature you will enjoy the impressive view of 110 km of mountains among the most beatiful in Europe. We are talking about the Monte Rosa chaine, the Ruitor Glacier and all the valleys of the Gran Paradiso National Park, with all their stateliness. Our village is surrounded by lawn with flowers and trees ... typical ancient tools here and there, in witness of the "old world", the small white church in the background ... just NATURE, simply NATURE everywhere ... the young and old just feeling and breathing the smell, the coulors and the sounds of the Alps!!! In "Vetan Village" you will also find: Tennis court, playground for children, solarium. 15 km from Saint Pierre, small village in a central position in the main valley. 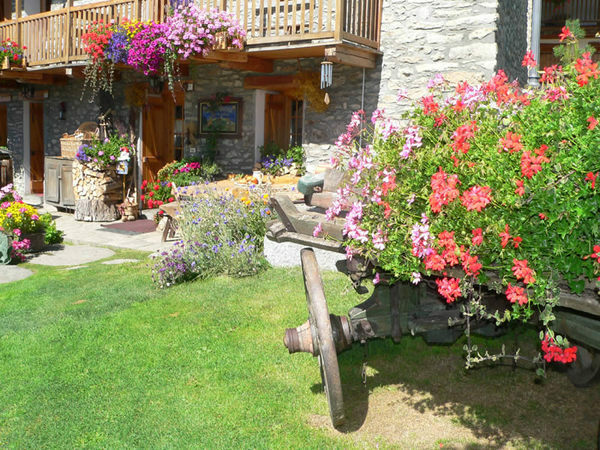 With its famous medieval Castle, its natural museum of flora and fauna, the shop "Pain de Coucou" (all about the traditions and local craftsmanship), its connection to the international motorway which crosses the Alps, Saint Pierre is a spot that you can not miss! !